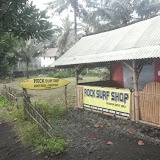 We did an early morning trip in a small bus to Medewi where there is a good reef break popular with surfers, but with a stony shoreline and lots of sharp oysters. I went for a nice walk around the area, talked to a local fishermen and had a look at the outrigger boats they go out fishing in. The waves today were much bigger. Some huge sets were coming in and breaking across the entire bay, including across the rip. Bruce took a few of us down the next beach where there was good wide sand and smaller waves. Clyde and Amy walked down the Bruce, while Marty, Ian and I headed out and did a downwinder to the beach. I waited for a quiet spell after a big set and got out without much trouble. I headed out and came back in (switching) up to near the waves. Turning around I had a moment of panic when another huge set looked to be coming, so I scooted back out quick, cresting over a big big wave. I then came back in toeside, with the kite higher in the sky than yesterday. By this time Marty and Ian had showed up so we headed past the point and out a bit. It seemed there was a huge surf between us and the beach, so I wondered if I could get in without a mishap. As we tacked in I saw some flattish water and bolted in, getting to the beach without any problems. I stopped and waited; Ian and Marty showed up and continued kiting, so I did some runs into the surf and back. The break was not consistent, but there were some flat sections allowing for turns or switching feet. I flew in to where Bruce was briefing the others and had a rest. I headed out after a while back into the surf, but got dumped by a large broken wave and crashed the kite, which the Bali boy grabbed. I reset the kite and went out again. I was feeling fairly confident getting over the broken waves. but some were just too savage and big. I crashed and relaunched my kite a couple of times, stacked with the kite flying too. I didn't really get to surf the waves on the way in though. On the last run I got dumped and tumbled again with the kite hitting the water. I nearly relaunched but some big waves loomed so I released it. It then started sailing away along the shore. I regretted not trying to relaunch it. I chased after it padding the board but it was going faster than I was. I then paddled to shore through the washing machine waves. 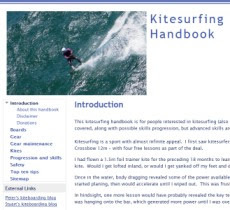 Just near shore I saw the Bali boy with my kite – it had been eventually swamped by a wave and washed straight in. We packed up and walked back, my kite heavy with water and volcanic basaltic sand. We got back to the main beach at 4:30pm, several of the guys were still out and having fun. The surf was still big. I pumped up my kite to dry it out and clean the sand off it. Off the beach to the unit for a shower and a rest, then down for the 6pm video review, which went well, apart from Ken talking too much. Some huge waves and huge sets. Not a good day to get smashed by the water. Sam ripped his 12m Switchblade down the middle so that kite is out of action.